I had just taken the letter from Markgraf Maximilian from the messenger and retired to my command tent to read it when Colonel Draufgängerisch of the Heavy Dragoons burst in. His men—or what was left of them, after they had charged headlong into that volley of artillery grapeshot—had fought bravely. Despite the Colonel’s enthusiasm, this news made little sense to me. 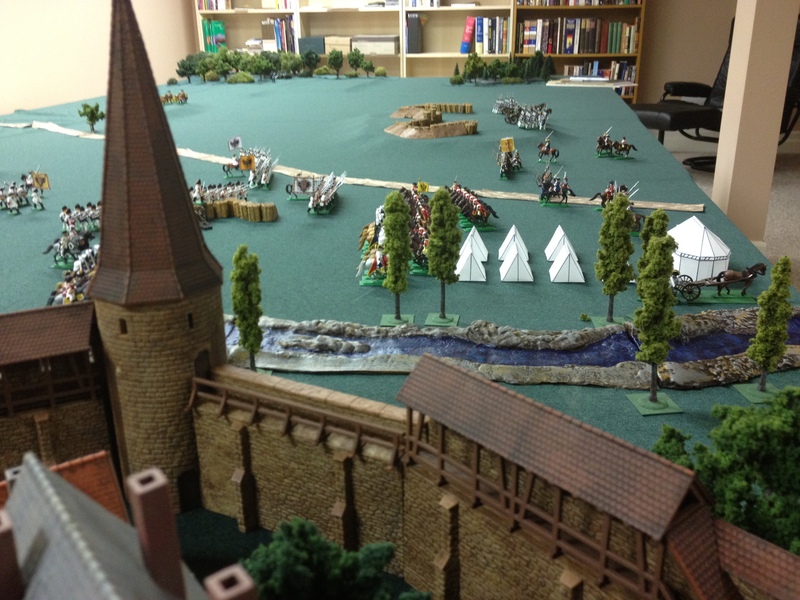 The army of Dautenstein had not been defeated at Wegweiser yesterday—at best, we had fought them to a bloody draw. Why then would my wily counterpart be pulling back so far? I had expected him to make a tactical withdrawal so that he might replenish his supplies, but no more than that. The answer, as it turned out, was to be found in the Margrave’s message. The Emperor had apparently grown weary of our little border squabble, and was sending a delegation from the Imperial Court to mediate an end to the dispute. The delegation would be headed, moreover, by one of the Emperor’s privy councillors, the ever-scheming Geheimrat Otto von Dautenstein. Otto was none other than the cousin of Grand Duke Rudolphus, and would almost certainly rule in the aggressor’s favour. It seemed logical to conclude that the enemy had withdrawn his forces in the belief that the campaign would soon be won without any further fighting. Politics, as I had so often said, is simply the continuation of war by other means. As if to prove the point, the Margrave’s letter—while informing me of this important political development, and containing the usual hollow references to Imperial authority, contained no actual instructions on what I was to do. I suspect that my princely ruler wished to avoid blame for whatever I decided. If I withdrew the army from the field, the anger of the good people of Lützelhard could be easily diverted by dismissing me from command and branding me as coward and a traitor. If I continued the attack unsuccessfully before the Imperial delegation arrived, I could be accused of recklessly flouting the wishes of the Emperor himself. I knew, of course, what the good Colonel Draufgängerisch would recommend if I asked him—to march on and once more meet the enemy on the field of battle. That man would ride his men to the gates of hell and back if he thought he could find a good fight! I dismissed the cavalry commander and instead turned to the young orderly who had joined my staff shortly after that first skirmish at Kleinen-Kreuzung. Although he spoke in the earthy and uneducated tones of a peasant, the young man was right. The damned cuckoo-clock makers of Dautenstein did still have our pigs. What’s more, they would likely have a great many more if the Geheimrat awarded them the disputed area of the borderlands. My soldiers—the recklessly unpredictable cavalry, the sturdy woodsman and hunters of the Feldjägerkorps, the unsteady drunks, forcibly-impressed vagabonds and dubious scoundrels of the infantry—would have all died in vain. The vagueness of the Margrave’s letter had seemed a trap, a noose around my neck. However, I now saw in it an opportunity to end this thing, once at for all. I turned to the young man, who by now was looking rather nervous at having spoken up. It was a five-day march to the city of Dautenstein, nestled in a shallow valley alongside the river Dautenfluss. Anxious to see this thing through before Imperial meddling could interfere, however, the men and I made it in four. The city itself was renowned for its neatness, punctuality, and beautiful (if slightly diminutive) proportions, having been designed by the the legendary German architect Faller himself. 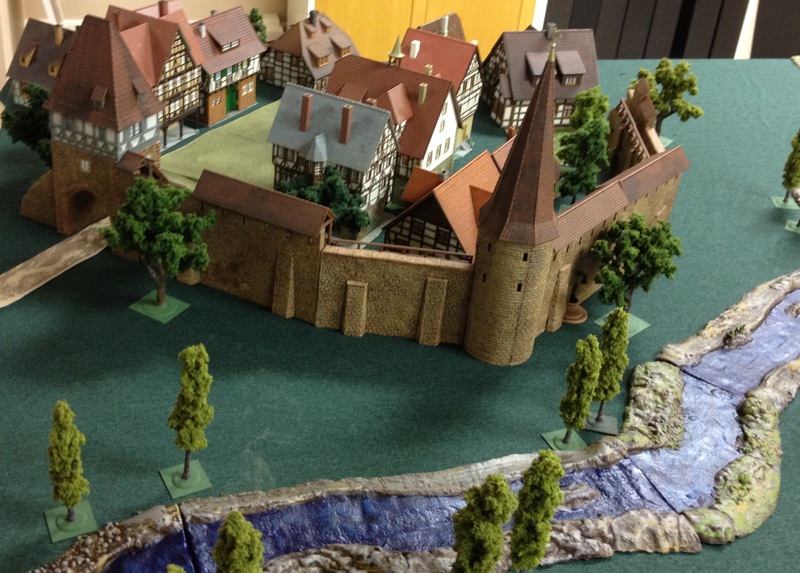 While the thin walls of the burg were more decorative than intended to withstand a battery by modern artillery, its geographic placement more than compensated: the Dautenfluss was too swift and deep to be safely forded, other than at a crossing a league or so to the south of our present position. Positioned astride the road leading to the river-crossing were two formidable redoubts, nicknamed “Michael” and “Samuel” by the locals after the two squabbling, mischievous kobold-sprites of the famous children’s story. Michael—the larger and more senior of the two—stood atop a low hill to the east of the road, its defensive breastworks providing a commanding view over the valley below. Samuel—the more recent of the fortifications—stood between the road on one side, and the river (and city) on the other. Any movement along the road towards the river crossing would thus soon find itself enfiladed by the crossfire of musket and cannon-shot from the two positions. Not surprisingly, the Grand Duke’s skilled military commander, General Alan von Scheunen, had drawn up his forces here. “Michael” was strongly garrisoned with two batteries of artillery and a regiment of infantry, while a battery of artillery and battalion of infantry were deployed at “Samuel.” A regiment of infantry, a unit of Grenadiers, and a formation of Guard heavy cavalry were positioned astride the road, while additional infantry and a large Dragoon regiment safeguarded the right flank of the fortified line. To the rear of Samuel, near the river, lay the tents of the enemy’s military encampment. Our forces were evenly matched. Some of the Dautenstein infantry battalions seemed a little understrength, likely a consequence of our murderous musket fire a week earlier at Wegweiser. On the other hand, I had much fewer cavalry than I had started the campaign with, while my Jägers were, not surprisingly, somewhat depleted after their heavy engagement in the last two battles. On the positive side, I had captured some additional guns at Wegweiser, and seemed to have an advantage in field artillery as a consequence. Surveying the battlefield at a distance, it was clear that the enemy’s fortifications would give him a decided advantage in any prolonged exchange of fire. Consequently, my assault must be as swift as possible. At least one of the redoubts would need to be forced if the road south was to be opened. An assault on the larger of the two, Michael, would allow me to employ the bulk of my forces—but it would be uphill, and against two batteries of guns as well as the muskets of its defending infantry. Moreover, both of my flanks would be exposed, and would have to be secured against a flanking attack. An assault against Samuel, on the other hand, would be a much more cramped affair, but would allow my right flank secured by the impassable Dautenfluss. And thus it was that I decided upon my cunning plan. The 2nd and 3rd Infantrie-Regiment Markgraf Maximilian von Lützelhard would advance west of the road and towards the smaller redoubt. The latter would assault the position if possible, but I fully expected them to be worn down by fierce enemy fire and eventually unable to press forward the attack. Thus they were to be followed closely behind by a second assault wave, composed of the elite Grenadier-Battalion d’Urfé, who would continue forward if the front line of infantry faltered. Fortunately, some of the men would be sheltered for the first part of the advance by a low hill just to the front of our initial line of deployment. In the centre of the battlefield, near the road and opposite the larger fortifications, I placed four batteries of guns of the Schwerefeldartillerie-Battalion Gräfin Alexandra, plus the 1st Infantrie-Regiment Markgraf Maximilian von Lützelhard. 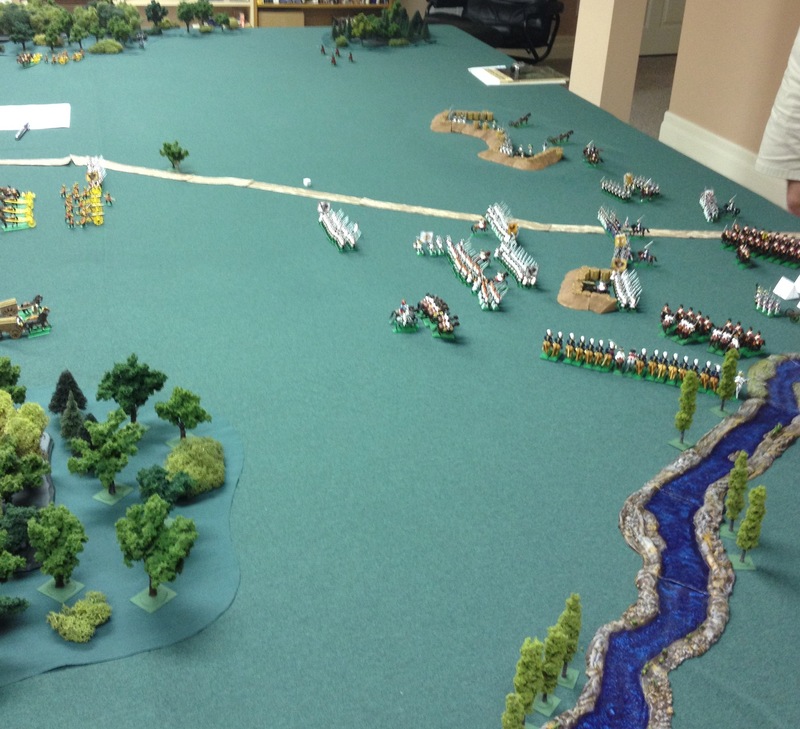 The guns would bombard the enemy positions as the main assault force approached, while the infantry would anchor the left flank of the assault and act as a reserve. 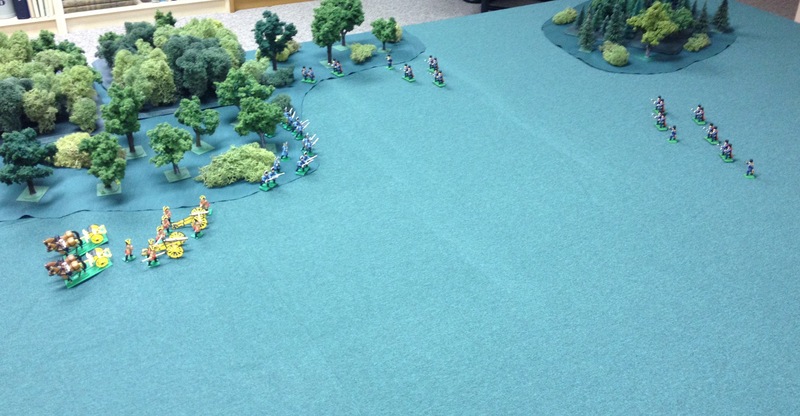 All of my cavalry—both the Heavy Dragoons of the Reiter-Regiment and the depleted Husaren-Regiment “Killerhasen” would advance rapidly through a gap in the woods and along the banks of the river, to the right of the main assault force. This was a someone unconventional deployment, in that the area would be rather more cramped than cavalry generally prefer. 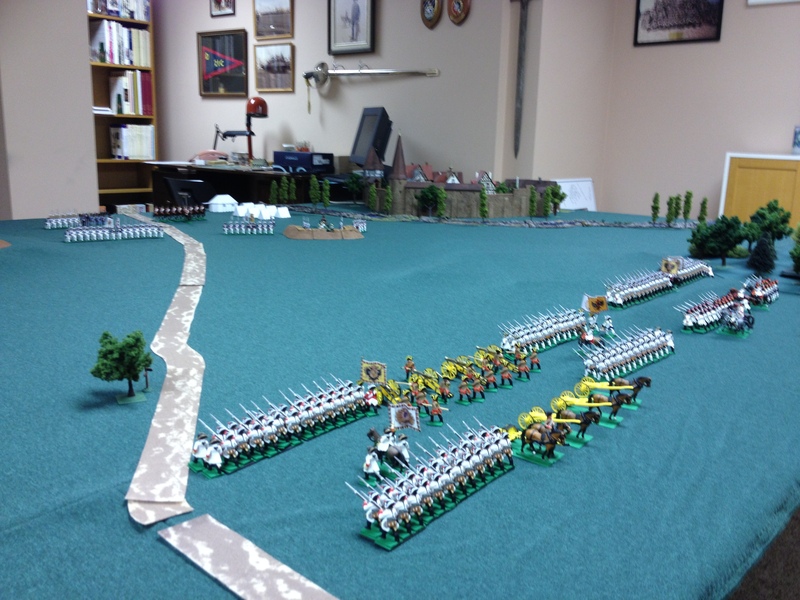 However, I hoped that if they timed a charge to coincide with the storming of “Samuel” they might affect a breakthrough between the redoubt and the river, moving on to sweep behind the enemy, destroy his camp, and catch the units on the road in the flank or rear. Moreover, their sudden appearance from the woods might further add to the surprise and intimidating ferocity of my attack. Finally, I deployed two more batteries of artillery on a hill some distance to the east of my main positions, with the Jägers ordered to take up positions in a nearby woods. 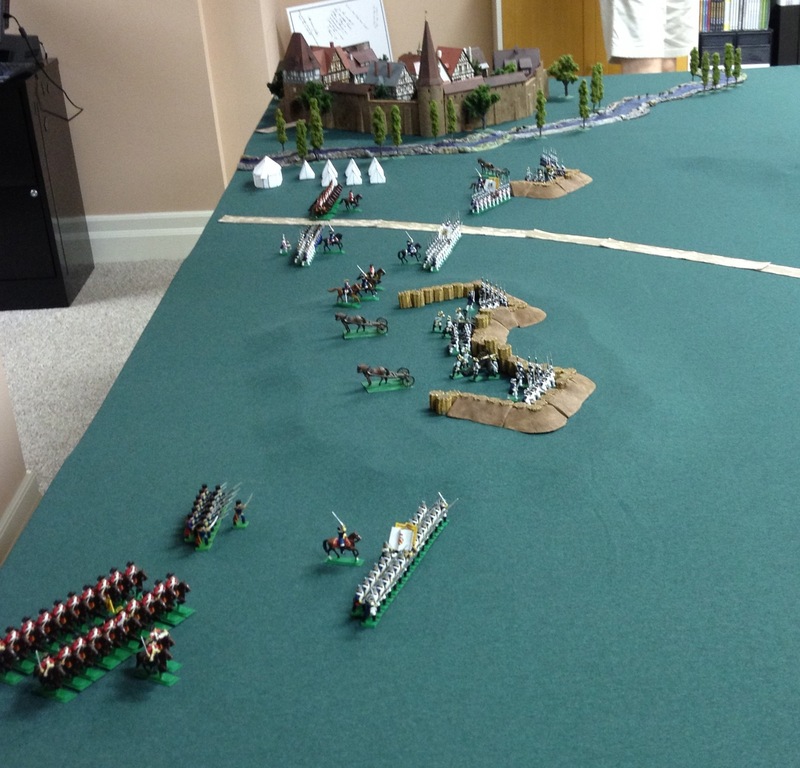 Clearly these forces would be too far from the main concentration to much affect the assault, although the guns could bombard “Michael” with some harassing fire. However, this weak deployment was intended, in part, to act as bait for the nearest enemy forces, hoping to distract them or delay them from reinforcing positions closer to the road. Moreover, by putting the artillery here it rendered it unlikely that the enemy would choose to either advance down from Michael or sweep around it to counterattack my main artillery position, for to do so would place any attacking force in the teeth of no fewer than six batteries of guns. 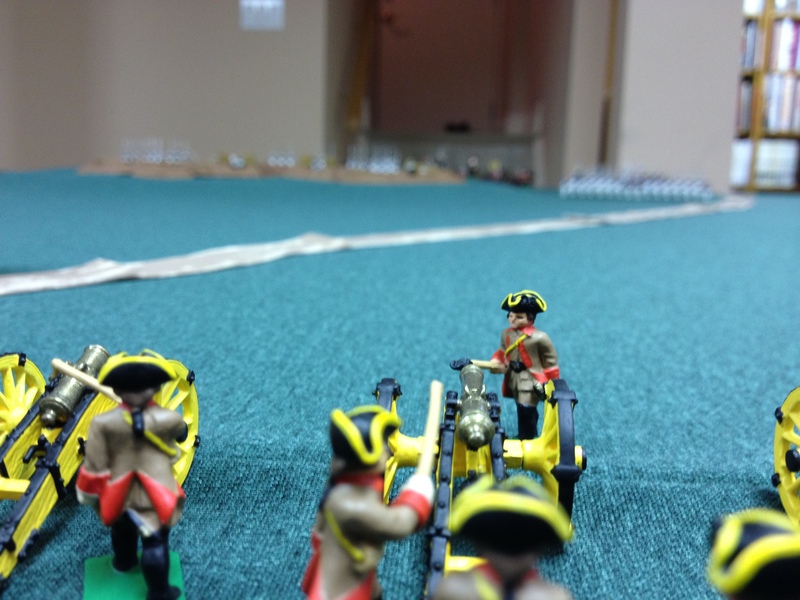 The start of our attack was signalled by the roar of our central batteries of cannons. In the distance we could see the heavy shot finding their mark, and leaving ragged holes in the formerly pristine Dautenstein ranks. On the farthest right of the line, my cavalry spurred their horses forward, threatening to sweep past between the fortification and the river. 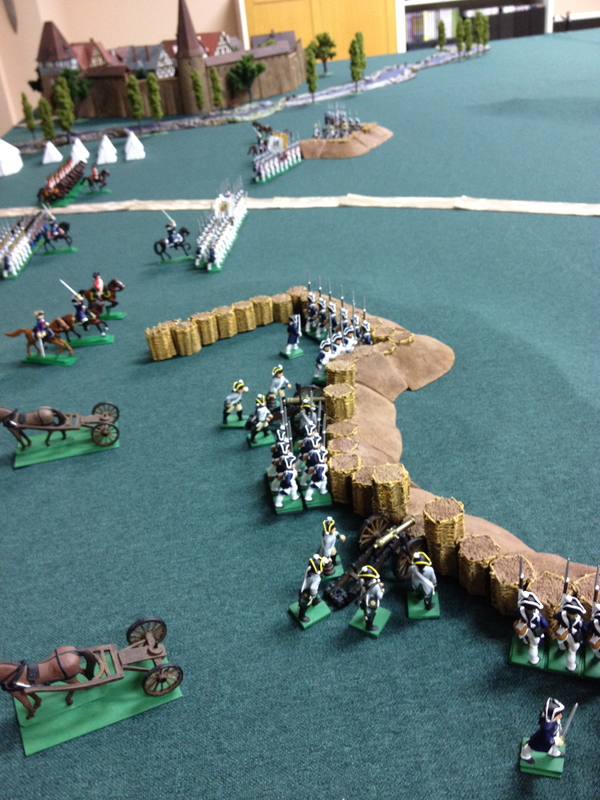 Clearly alarmed by this development, the Dautenstein gunners spent precious minutes manhandling their gun battery from behind the gabions and into a new position on the flank of strongpoint, while a unit of Guard cavalry rode up to face my riders. 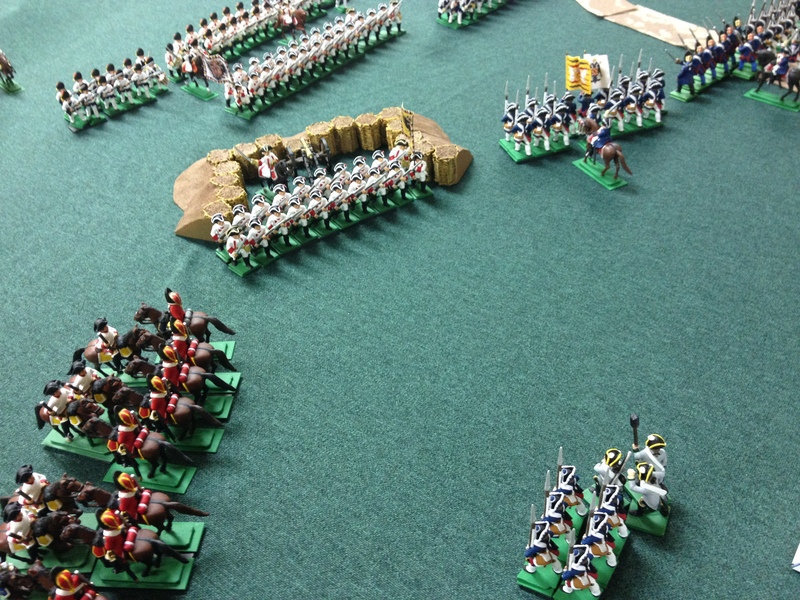 No sooner had they done so, however, when my infantry began their advance towards the same enemy position, the drummers beating out the pace of a steady advance. As our main force crested the low rise between my position and the enemy lines, members of the baggage train followed behind with their carts, ready to liberate any pigs that we might find when we entered the enemy camp, and thereafter return them to their rightful owners. My skilled opponent did not fall for the meagre bait I had left on the far left of my line. Instead, as the concentration of my main effort against “Samuel” became clear, von Scheunen moved to redeploy the infantry and cavalry east of “Michael” across to the now-threatened section of his defensive line. 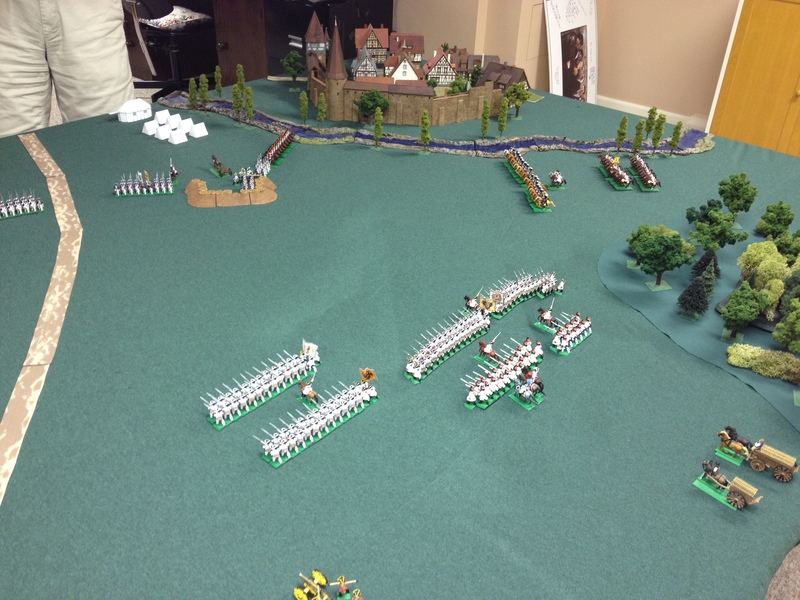 Some light infantry were sent forward to harass my Jägers and artillery, but they would soon retreat when confronted with a whiff of roundshot and the ever-accurate rifle fire of the sharpshooting woodsmen of the Dunkelwald. Meanwhile, my assault force marched ever closer to their intended target. As they did so, the increasingly panicky gunners within the redoubt shifted their gun battery back to its original position. A few of our brave soldiers began to fall from enemy fire, but it did not slow our relentless progress. The critical moment was close. I sent orders that a battalion of the 1st Infantrie-Regiment be released from the reserve and move to reinforce the main assault force. Glauben haben, Schweinen aus Lützelhard! Wir kommen um dich zu retten! 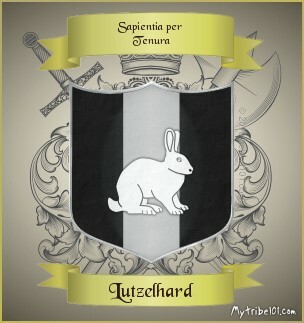 Have faith, pigs of Lutzelhard! We are coming to save you! Once upon a time these men had been thought of as drunks, dregs, and delinquents. Left unguarded in the vicinity of a tavern, they no doubt were. But in this place, at this time, they had been forged by rough discipline and common purpose into a wrathful instrument of justice and retribution. Clearly many of the enemy were shaken by this demonstration of the steely resolve of our stalwart soldiers. As they cowered behind their gabions and entrenchments, the fire of of the Dautenstein gunners often went wild—thankfully missing our serried ranks. With bayonets gleaming in the sunlight, the 2nd Battalion, 3rd Infantrie-Regiment Markgraf Maximilian von Lützelhard shouted one last time, then stormed into the enemy position. 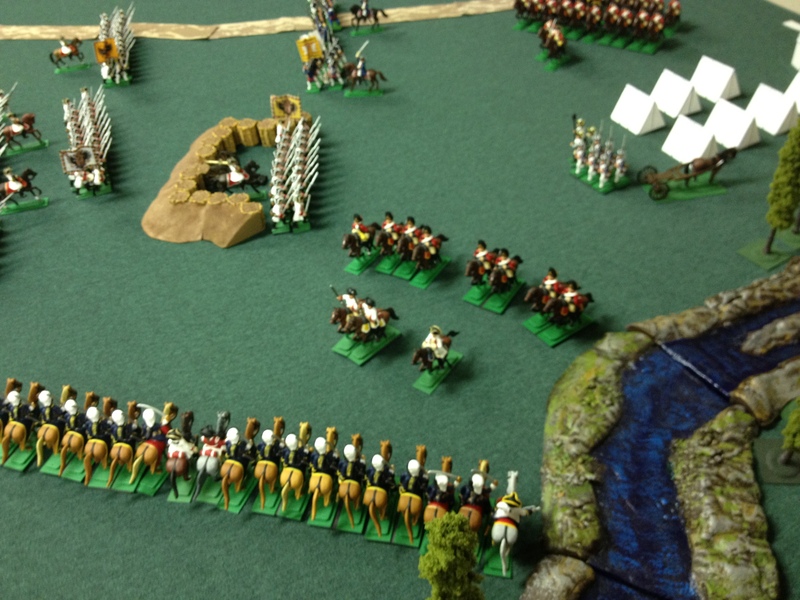 Taking personal command of the Heavy Dragoons, I raised my sabre and ordered the cavalry to also charge forward. As the infantry clambered over and into the redoubt, stabbing and shooting down its defenders, the Dragoons slammed into enemy foot soldiers and cavalry nearby. 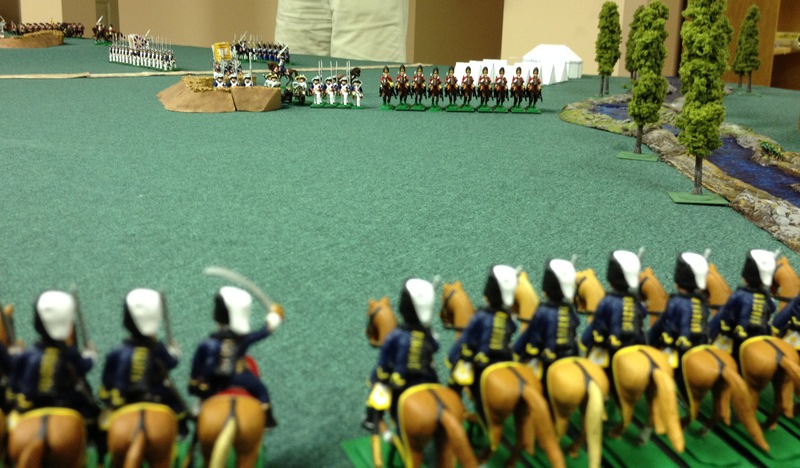 Behind us the Grenadiers and Hussars stood ready to exploit any breakthrough. Our glorious flag was raised atop the breastworks—success! The enemy began to flee from Samuel, leaving behind their wounded and an abandoned gun. 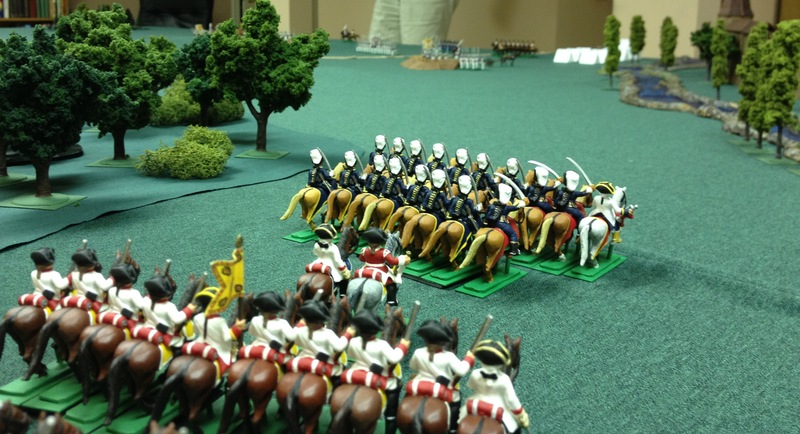 The Dragoons, however, faced a tougher fight against the formidable Dautenstein Guards. Doubtless the enemy cavalry knew that, should they lose this battle, there would be no more free pork dinners. 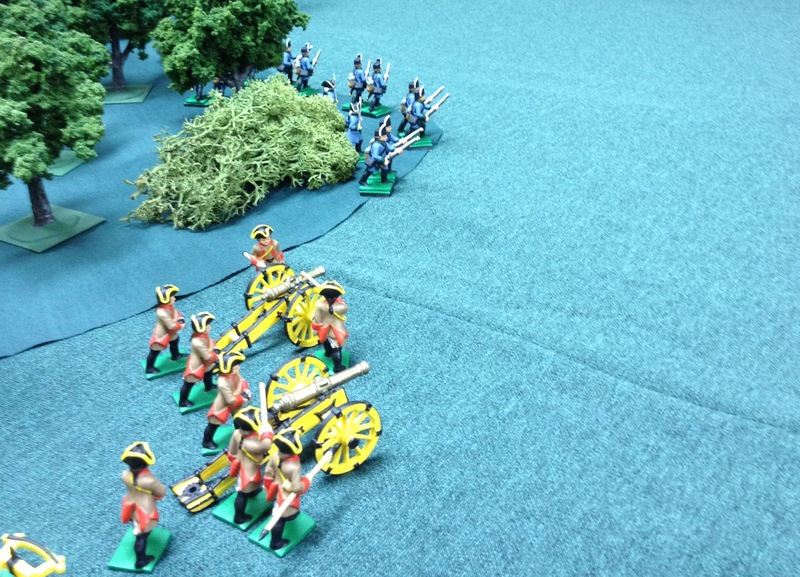 The rest of our main force advanced slowly along the main road, pausing from time to time to fire a deadly volley of musket fire into the enemy’s blocking force. One enemy regiment began to falter, then fall back. 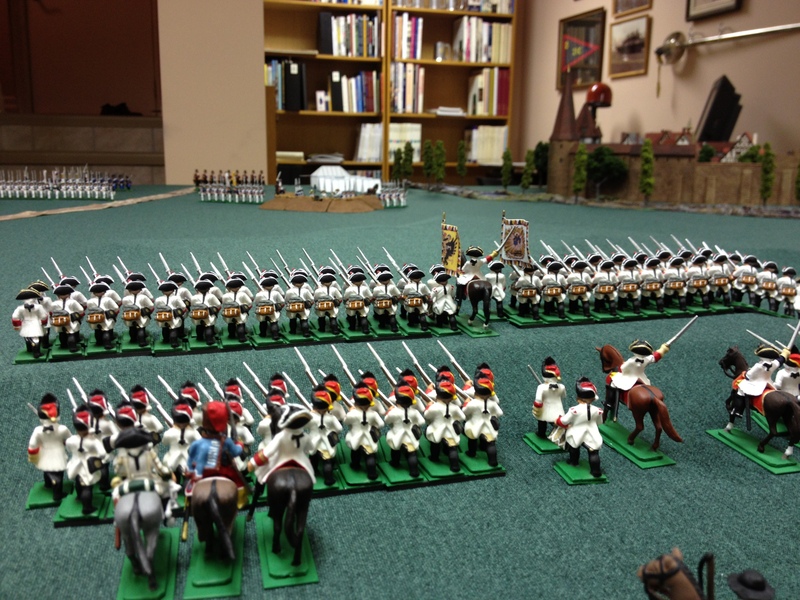 A squadron of Heavy Dragoons of the Reiter-Regiment rallied back on my command, and reformed its ranks. The second, however, was broken in the melee with the Dautenstein Guard, and began to flee. 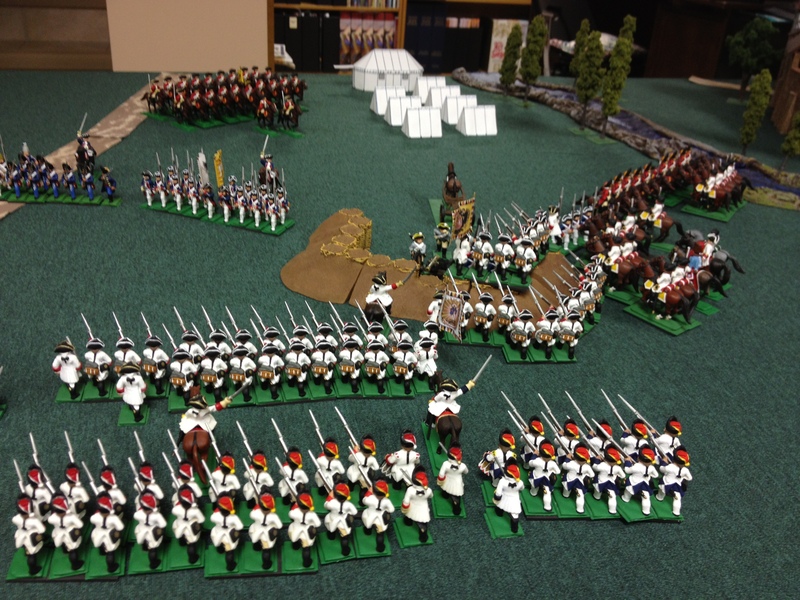 Fortunately the two squadrons of Hussars stood ready not far behind. Having performed so poorly a week before, they were anxious to prove their mettle today upon the field of battle. In a desperate attempt to salvage his position and protect his camp, von Scheunen ordered his cavalry reinforcements—which had only just redeployed from his right flank—to charge into the battalion now holding “Samuel.” Such was the thunderous pounding of their hooves on the ground that our official war artist was forced to paint the action with a slight blur. After a bloody fight our men broke, abandoning the position they had only just captured. Before they did so, however, young Leopold Lutz—pressed into military service at 14 years of age to pay off his parents’ debts, and the most junior member of the battalion—retrieved the colours from the unit’s fallen standard-bearer and brought them back to our lines. Despite their current retreat, my heart was filled with martial pride at what the 3rd Infantrie-Regiment Markgraf Maximilian von Lützelhard had done today. I had no doubt that patriotic hymns and ribald drinking songs would soon be dedicated to their accomplishments. 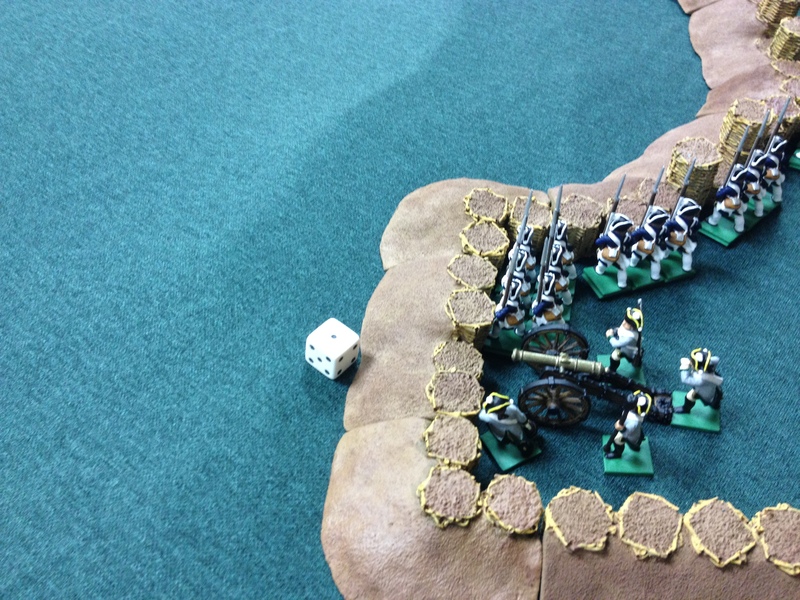 The enemy’s cavalry charge had won my opponent a brief respite, but no more. The Grenadiers d’Urfé advanced to a firing position on the edge of the redoubt. 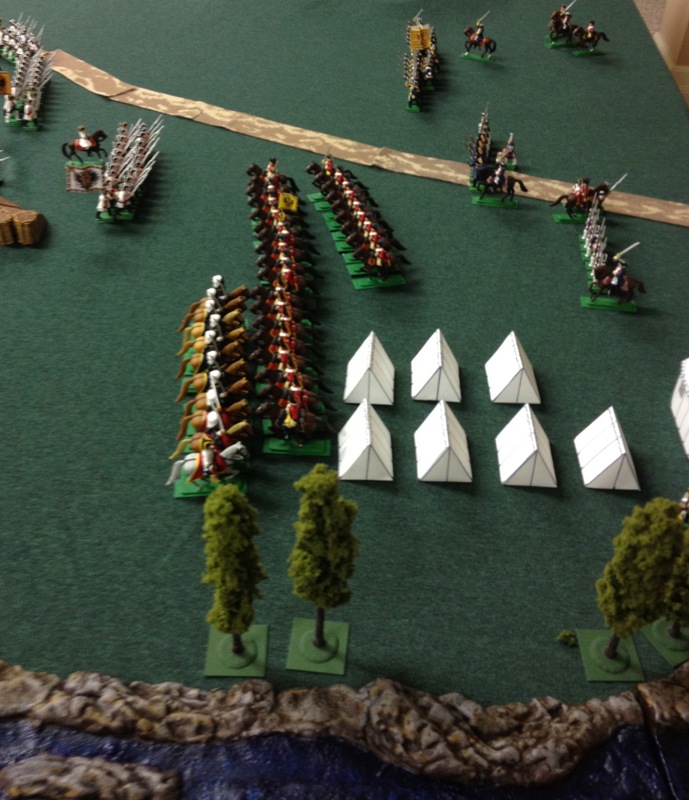 Along the road, the enemy’s grenadiers now wavered and began to fall back. Their centre was collapsing under the weight of our assault. Fearful that our foe might attempt to hold some of our captured pigs hostage, a squadron of the Husaren-Regiment galloped forward to engage the enemy cavalry. As they did so, an anguished cry could be heard from the citizens of Dautenstein who had been watching the unfolding battle from the walls of their capital. Alles ist verloren! Die Armee wurde besiegt! Sure enough, the enemy army had begun to withdraw, abandoning the “Michael” redoubt and streaming to the rear. The war had been won! Von Scheunen, an officer and gentleman to the last, surrendered his remaining forces to avoid further bloodshed. He was allowed to keep his sword in recognition of his honourable conduct. Scores of porcine prisoners were freed from the enemy’s encampment, and wagon-loads of cuckoo-clocks were seized from Dautenstein in reparation for the aggression that his been visited upon Lützelhard. While the men were strictly prohibited from acts of unauthorized looting or excessively wanton destruction, they were given several days in which to enjoy the hostelries and public (and private) houses of the city. The incidental damage that ensued was regrettable, but war is altogether a regrettable business, and it had not been our people who started this one. As for me, I had the pleasure of greeting Geheimrat Otto a few days later, when he arrived in Dautenstein only to find it under new management. Diplomacy is not my business, of course, and I deferred negotiations to the Margrave and his counsellors. However, I imagine that the position of Grand Duke Rudolphus will be rather less grand when all of the talking is done. This guy has such a natural flair! I love his style. Greatpics, engaging commentary, and massive period authenticity.